U.S Navy SEALs attack a simulated enemy threat during Operation Corkscrew as part of Emerald Warrior 2013, Camp Shelby, Miss., April 29, 2013. During the operation, the SEALs extracted two simulated downed helicopter pilots back to safety. U>S Air Force photo by Staff Sgt. Chris Griffin. 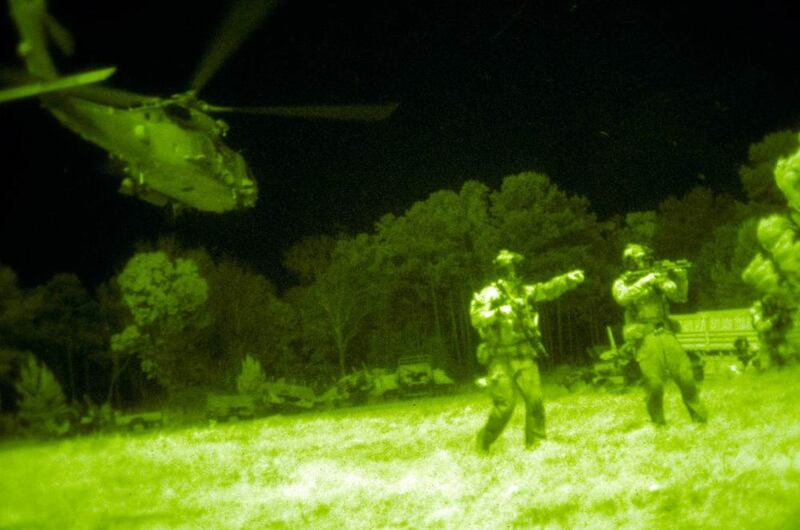 A U.S Navy SEAL scans a field for simulated enemy threats during Operation Urban Corkscrew as part of Emerald Warrior 2013 at Camp Shelby, Miss., April 23, 2013. DoD photo by Staff Sgt. Chris Griffin, U.S Air Force. A Navy SEAL fires a MK 11 sniper rifle from an MH-60S Sea Hawk helicopter assigned to Helicopter Sea Control Squadron 9, deployed aboard the aircraft carrier USS George H.W Bush, during a training flight. George H.W. Bush was deployed to the U.S 5th fleet area of responsibility on its first operational deployment conducting maritime security operations and support missions as part of Operations Enduring Freedom and New Dawn U.S Navy photo by Seaman Apprentice Brian Read Castillo. A 4-man SEAL fire team during tactical warfare training. The SEAL with the radio on his back is known as the RTO, which stands for Radio Telephone Operator, something of an old-fashioned military term that has nonetheless stuck. Wherever they operate, the radio is one of the most vital pieces of equipment that special ops teams carry. This ia a vintage shot, taken in 1987. Note the Colt Model 653 carbine fitted with an M203 40mm grenade launcher. A pair of Navy SEALs from SEAL Team 18 pictured during an exercise in Norway, 2010 with the German Kommando Spezialkrafte (KSK). SEAL Team 18 are a reserves component of Naval Special Warfare Command (Naval Special Warfare Group 11). A Navy SEAL, assigned to an East Coast SEAL Team, engages targets at an indoor shooting range, September 2012. East Coast SEAL Teams are part of Naval Special Warfare Group 2, based at Little Creek, Virginia, and include SEAL Teams 2, 4, 8 and 10. SEAL Teams 1, 3, 5 and 7 belong to Naval Special Warfare Group 1, out of Coronado, California. Note the SEALs carbine is fitted with a Eotech EXPS3 (SU-231A/PEQ) holographic sight with a flip-to-side magnifier mounted to its rear. This arrangement allows the user to quickly switch between close and longer range shooting. The Navy SEALs are a Navy Special Warfare unit that carries out direct action, special reconnaissance and counter terrorism operations. A pair of US Navy SEAL combat swimmers wear rebreathers and use compasses fitted to swim boards to navigate through murky waters. SEALs typically operate in teams no smaller than two (a 'swim pair'). The SEALs are wearing LAR V Draeger rebreathers, closed-circuit breathing systems suitable for clandestine operations in shallow waters . A trio of U.S. Navy SEALs cover their arcs of fire while moving through water. The SEALs are wearing woodland Battle Dress Uniforms (BDU), woodland boonie hats and the SEAL in the foreground is wearing matching face camo paint. The use of woodland camo and CAR-15 carbines indicates that this photo comes from the late 1980s/ early 1990s. SEALs recently moved away from wearing woodland BDUs when deployed, although they are still worn by BUD/s trainees. A pair of Navy SEAL combat divers go prone on a beach after coming ashore. SEALs hardly ever work alone. The "buddy system", where each SEAL has a fellow SEAL watching his back, is an important part of SEAL training. SEAL swim pairs are the cornerstone of SEAL operations. An Afghan National Army commando from the 3rd Commando Kandak and a Navy SEAL team member, scan the horizon during a patrol of Gerandai village, Panjwai district, Kandahar province, Afghanistan, May 16, 2012. A special operations forces member with the Navy SEALs firing his sniper rifle from a hilltop during a firefight near Nawa Garay village, Kajran district, Daykundi province, Afghanistan.